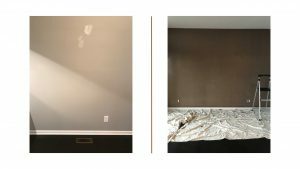 We selected a dark brown paint and honestly I feel we should have gone darker. 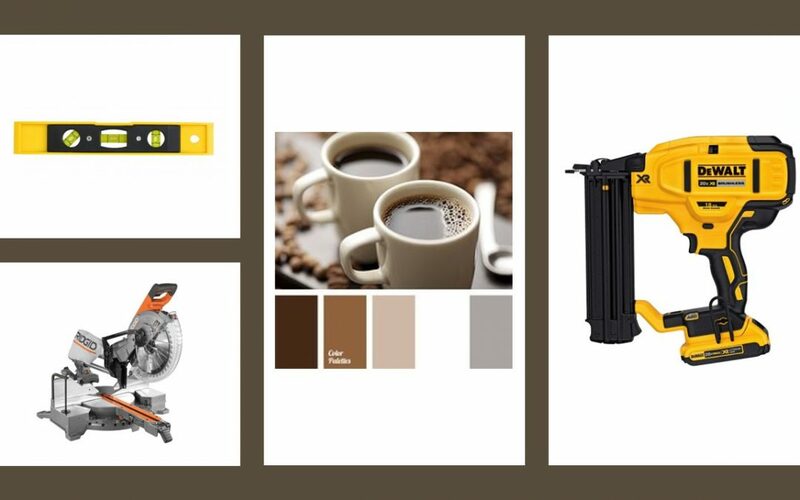 Select a VERY dark brown or even go with black for your base. 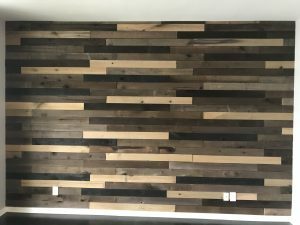 Open several boxes of wood panels so that you can see the color selection you have to work with and can select your favorite boards for the best impact locations on your wall. We chose to use Weaber Weathered Hardwood. Although this isn’t a reclaimed product we selected it for: color, ease of install, price, and excellent reviews. DO NOT PRE-CUT BOARDS! We thought we would save time by pre-cutting boards. 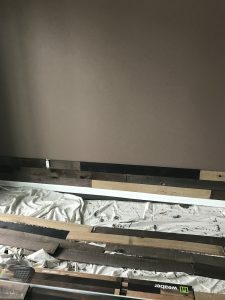 As a result, this ended in waste because what we found was that as we worked our way up the wall the boards and the wall itself were not a consistent width. Most importantly, measure, remeasure, and remeasure again before you cut. Step 3: Starting at the bottom, begin installing your boards. Using a stud finder mark your wall with a pencil where studs are found. Don’t worry about the size or darkness of the pencil marks because you will be covering them with wood. Hold your board to the wall and use a level to make sure it is straight. Using the brad gun attach with several brads hitting a stud when you can. This wood is so light that it is not imperative to find studs, but recommended where you can. The instructions that came with our boards said that you could use liquid nails to install, but we felt this would make it more difficult to repair or change in the future. 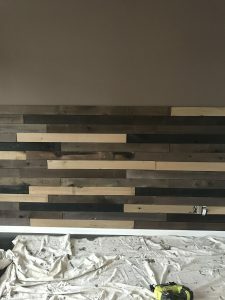 Measure shorter boards to give your wall a staggered look and cut with a miter saw. If you don’t own one you can rent one inexpensively for this project. We recommend renting a table as well so that you are standing as you cut. As you can see in the photo, we got very lucky with our outlets. They were even with our board placement. If you stare very closely to this wall you will see gaps. To my Type A horror! This is why we went to the trouble of painting the wall first. When you take a step back and look it is stunning. Trust in the process and you will be exceptionally pleased when your project is complete. Before you continue up the wall make sure that you have several of boxes of product open. This will let you know ahead of time what color boards you have to work with. For instance, we purchased 13 boxes and were pleased that no two were the same; however, what we found was our last few boxes didn’t have our favorite dark color. Install outlet box extensions, if needed, before putting your outlet covers back on. This shields exposed electrical connections. Here’s a photo of the completed project. I cannot wait to get the furniture delivered and start the finishing touches. Come back soon to see the room decorated.